The Classic Club is a truly spectacular destination for any event, with four unique private dining venues to choose from we can accommodate a variety of events from large corporate seminars to intimate rehearsal dinners. With a commanding view of our championship 18-hole golf course and Little San Bernadino Mountains beyond, Classic Club offers a stunning location for your Palm Desert wedding. Sitting high atop the Valley our Mediterranean-style clubhouse has a grand presence which will make any wedding feel like a royal one. Slate bridges with waterfalls surrounded by flowing lily padded ponds and streams create a stunning backdrop for picture perfect memories. Each bride is unique and her wedding should reflect her personal style and vision. 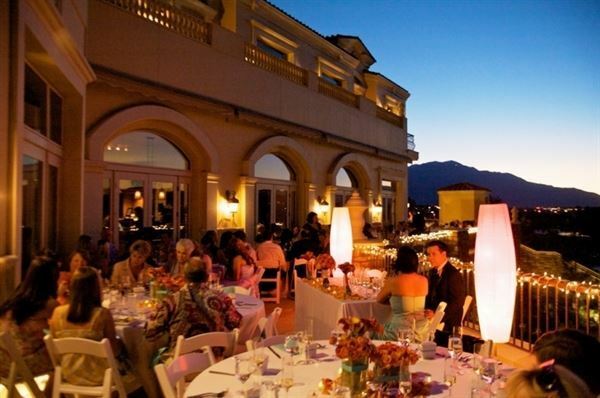 Classic Club offers many venue options for both ceremonies and receptions in Palm Desert, allowing brides to create an experience all their own. While wedding packages are provided, they serve merely as a suggestion which provides our brides with the opportunity to custom design their special day. With a warm fire place, rich wood accents and a panoramic view of the Classic Course and Little San Bernardino Mountains. With Grand Entrance off the lobby, Quietly Private. Atmosphere/Decor: Wrap around Terrace, Wine Bar and Library featuring panoramic views of the Classic Course and Mountain backdrop.